The Taranga Vineyards are 6th generation owned by the Oliver Family with Corrina Wright (part of the 6th generation) being the winemaker. The 96 ha of vineyards, first planted in 1841, are home to mainly Shiraz and Cabernet Sauvignon, but also include 14 other varieties. 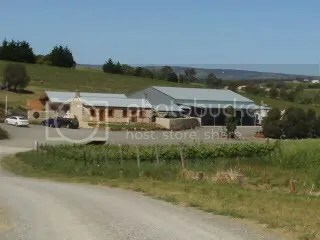 Most of the grapes are sold, with the added distinction that one block is sold as Penfolds Grange stock (the only Grange supplier in McLaren Vale). The family are experimenting with “new” varieties such as Fiano to review the ability of these varieties to assist in sustainable farming (in this case reducing water consumption). The Olivers are part of the McLaren Vale sustainable initiative called Generational Farming Sustainability Farming where vineyards will be assessed on their sustainability (in the areas of pest & disease control, soil & weed management, water use, environmental management & continuing education). The system will lead to vineyards being able to obtain a sustainable certification. About 60 McLaren Vale vineyards have joined this excellent local initiative. The wines have been of a quality for James Halliday to give the winery a 5 Star rating. The cellar door is on Seaview Road (see map). They are open 10 am to 4 pm daily. It was interesting to note that a winery on the right as you come into McLaren Vale which is now owned by Simon Hackett was once called Taranga (about 25 years ago). I had thought that this winery was owned by the Olivers. Corrina put me straight that this winery had no association with the Oliver family. It was a mistake that many people make and they get asked this quite often. Olive oil is also available with excellent award winning packaging. The bottle with an olive wood stopper is classy. Please note that the wines attract a discount if you purchase any 6 wines or more from the cellar door. The pricing below will indicate the individual price first and then the 6+ purchase price second. Plenty of general fruit on the nose with a hint of tropical characters. Excellent acid finish on the wine with a textured mouthfeel – almost viscous! One of the Italian trial varieties with the fruit showing good acid even during the hottest growing seasons – like to 2009 growing season. This is a good food wine and I would like it with a plate of BBQ’d Octopus with a lemon marinade. I found the nose on this wine a little closed – possibly as the wine was a bit cold. The palate had lots of apricot and dried fruits with an excellent acid zing on the finish. This wine should be drunk while young and a pan seared tuna steak would be a good match. This spanish variety is showing some good wines in McLaren Vale. Taranga Vineyard is doing a good job with this emerging variety. Some of their grapes are going into other winery wines in the district and the grapes going into this wine are also pretty good too. The wine has earthy characters with a hint of spice on the nose. When it enters your mouth it shows lovely black berry fruit and finished with very dry dusty tannins. The wine has a lighter colour that I would normally expect from a McLaren Vale Grenache, however this does not take anything away from the wine. With a perfumed nose with hints of stewed plums followed by a flavour packed mouth full of plums, cherries with hints of pepper. Bring on Mums Sunday Lamb Roast with a bottle or 2 of this wine. This wine is a vineyard blend – in other words Corrina has enough confidence in the vineyard blocks that the grapes are picked, crushed and fermented together. By doing this the extraction from the 2 varieties are different that if the wines were fermented separately. It is also great to see another example of the blend seen alot back in the 80’s. There is the black fruits of the Cabernet coming through on the nose. When the wine hits the mouth there is a lingering composite of blackberries, chocolate, tannins and oak characters. If this wine style has been out of favour then this wine should be seen as a beacon to say otherwise. The wine is drinking well now but it has a few more years ahead of it. I can think of nothing better than to drink this with BBQ’d meats. This is a dense big wine that is a joyful arrangement that fills the whole mouth full of licorice and rich ripe black fruits that finished with some spice action. Fine tannins and good fruit/oak balance makes this a winner. It maybe me being one dimensional but yet again I see this with a juicy Wychood Meats Rump Steak with an infusion of mushrooms, red capsicum, onions and tomatoes brought together with some Coriole Vin Cotta. The best barrels of the yearly shiraz offerings goes into this reserve wine. This wine does not disappoint. A spiced lift on the nose through to the silky smooth palate. Here is all the black fruits, plums, pepper mixed with the elegant tannins from fine french oak. This wine has all the finesse one should see in a reserve wine and leaving this for about 10 years would see a gem. This wine is not available at this time – it has been so popular that they had to remove it from sale. The wine is drawn from a 20 year old solera system, so to keep with wines integrity only a certain amount can be withdrawn. Expect the wine back at the cellar door in about 6 months. The wine shows all that you would expect from a 20 year old fortified – rancio characters, hazelnuts and toffee – YUM. The packaging is first class and I understand this wine has been frequently purchased with gift giving in mind! 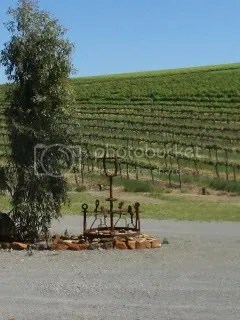 This entry was posted in Mclaren Vale, wine and tagged cellar door, Grenache, Mclaren Vale, McLaren Vale Wine, Shiraz, Small Producer, wine, wine McLaren Vale. Bookmark the permalink.